This is a drawing of a cat called Akira. I made a portrait of Akira in watercolor and ballpoint pen a while ago. Not long after the owner receiving the drawing, Akira passed away, and the owner asked me to do another portrait – this time in ballpoint pen. I hope that this portrait will help keep the memory of Akira alive. The drawing is done on watercolor paper in A5 size. 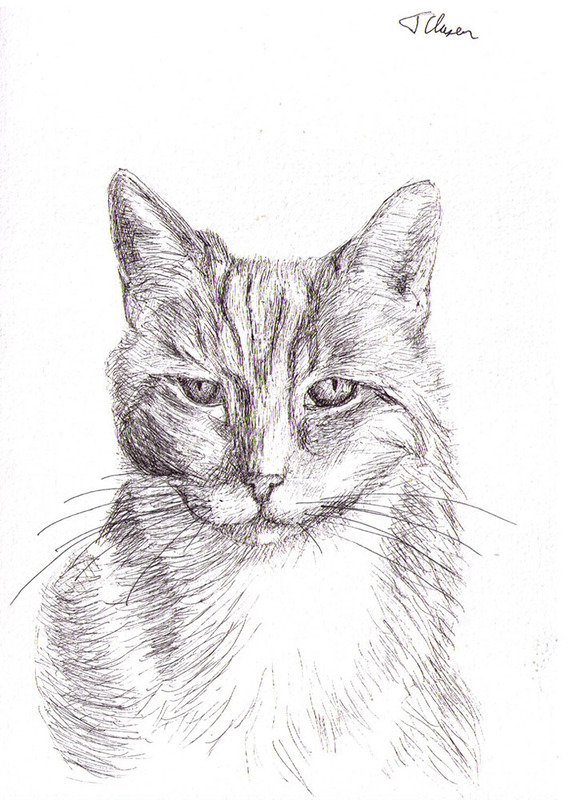 Tagged Ballpoint pen, Cat, commission, Drawing, FeaturedBookmark the permalink. This is a lovely drawing and knowing the story makes the cat’s expression seem wistful and somewhat poignant. Thanks a lot Laura. I hope the owner will feel the same! This one is so beautiful. Soft. Congratulations. The owner will be very happy. Thanks a lot 🙂 I hope so ! I love this drawing and the expression on the cats face.